Plant a tree in memory of Margaret "Tootsie"
Be the first to share your favorite memory, photo or story of Margaret "Tootsie". This memorial page is dedicated for family, friends and future generations to celebrate the life of their loved one. 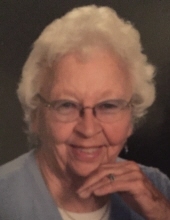 Margaret Mae “Tootsie” Gardner (85) passed away February 6th at the Bee Hive Assisted Living Facility. She was born in Black Eagle on August 11, 1933 to Edith and Ted Vik. She grew up in Great Falls with her parents and four older siblings. Being the baby of the family, she had a lot of special love and attention from many family members and friends. Tootsie met the love of her life at a USO dance in Great Falls. She was crowned “Queen” of the dance, she then drew a name out of a hat for her “King”. Bob Gardner was that lucky young airman. After a few months of dating, they spent the next 66 years in marriage. Together they raised two daughters and a son. Tootsie worked at the county courthouse and retired the same day as Bob in 1986 after 29 years. She was an active volunteer at the FISH food bank. She loved to bake and for years she delivered plates of goodies to friends and residents in nursing homes around town. Tootsie and Bob were very fortunate to be able to spend 23 winters in San Antonio where they met incredible lifelong friends. Tootsie had such a big heart. She was always there to help anyone in need. She spent hours sewing baby blankets to give away. Hundreds of little ones were wrapped in her creations and that gave her great joy. She had an obvious love for all kinds of animals. Tootsie would not pass up a chance to pet or cuddle a dog or cat when she had the chance. She kept dog treats by their front door to hand out to dogs passing by on leashes. They all knew where she and Bob lived and would slow down and stare at their front glass doors until noticed. Tootsie is survived by her loving husband, Bob; their daughters, Louann (Harry) Wolfchief, Missoula; Peggy (Tim) Reynolds, Billings; their son, Larry (Vicki) Gardner, Deer Park, WA; her brother, Archie (Judy) Vik, Boulder City, NV; sister in law, Polly Vik, Great Falls; seven grandchildren, eleven great- grandchildren and several nieces, nephews and cousins. She was preceded in death by her parents; her brother and sister in law, Bob and Mary Vik; her sister and brother-in-law, Betty and Stan Hall and her brother Bill Vik. Cremation has taken place, and as per Tootsie’s wishes, a family graveside burial will take place in the summer. A special thank you to the caring staff at Bee Hive Homes, Mesquite house, and Tina Hasbrook with Peace Hospice. To plant a tree in memory of Margaret "Tootsie" Mae Gardner, please visit our Tribute Store. "Email Address" would like to share the life celebration of Margaret "Tootsie" Mae Gardner. Click on the "link" to go to share a favorite memory or leave a condolence message for the family.